Acta Philosophica is a double blind peer reviewed International Journal founded in 1992, and from the beginning it has enjoyed the collaboration of scholars working in universities around the world. It thus serves as an instrument of dialogue and collaboration among the various fields of philosophical research. The journal was published by Armando Editore until 2004, and thereafter by Fabrizio Serra Editore (Pisa - Rome). The editorial policy remains that of the Philosophy Department of the Pontifical University of the Holy Cross. The annual volume comprises two issues of about 200 pages each. The journal publishes articles in Italian, English, Spanish, and French, regarding the main areas of philosophical debate. Particular attention is given to the dialogue between philosophy and science, and to the questions surrounding the relationships between faith and reason and between classical philosophy and contemporary thought. Ample space is also devoted to the presentation of recent philosophical works. Each issue is divided into the following sections: Studies, Notes and Comments, Bibliographical Guide, Reviews, and Bibliographical Notes. There is also an annual Forum section, containing the discussion of a recent book or a specific topic. Periodically a special Monothematic Section is offered. For those dedicated to the study and teaching of philosophy, the journal is a valuable resource for up-to-date information and in-depth reflection. The articles are indexed by: Arts and Humanities Citation Index (Thomson ISI), ATLA CPLI, Current Contents/Arts and Humanities, Dialnet-Universidad de la Rioja, European Reference Index for the Humanities (ERIH), Google Scholar, GVK-Gemeinsamer Verbundkatalog, JournalTOCs, MLA International Bibliography, Philosophy Documentation Center, Répertoire Bibliographique de la Philosophie, Scopus, The Philosopher's Index, Zeitschriftendatenbank (ZDB). It is possible to download the pdf of the published papers (until the year 2010). 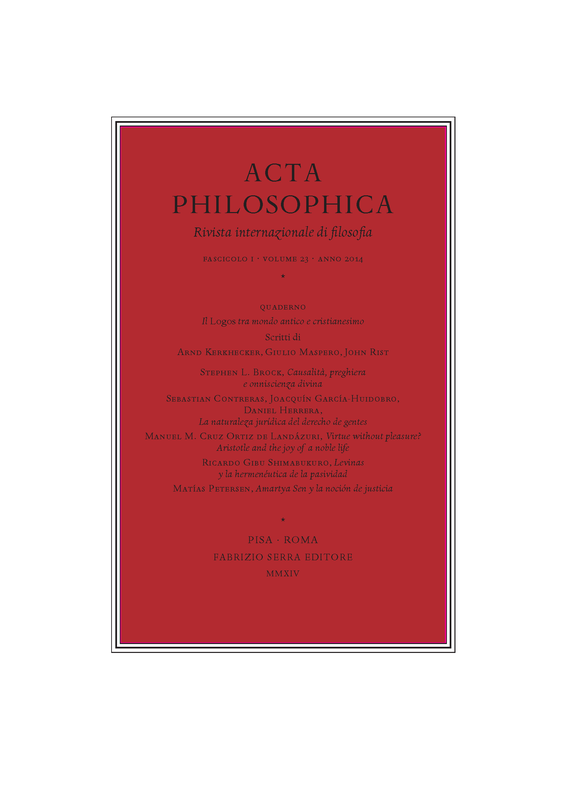 The first issue of 2019 International Journal of Philosophy "Acta Philosophica" has been published. The summary is available at the following link: http://www.actaphilosophica.it/en/issue-2019-1. Che cosa rimane oggi della Metafisica di Aristotele?